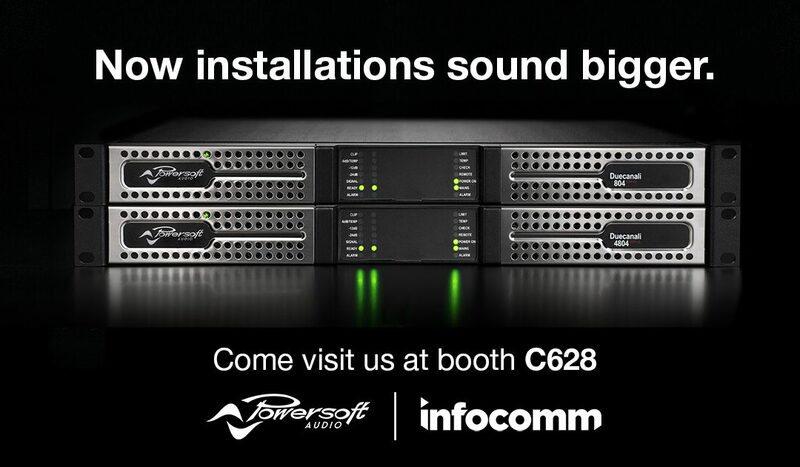 At this year’s InfoComm show, held in Las Vegas from the 2nd to the 8th of June, we will showcase the new members of the Duecanali Series, namely the 804, and the 4804. The Duecanali 4804 provides 2 x 2400W @ 4 ?, a power output suitable to a wide range of projects, making it an attractive and cost-effective solution for small to medium size installations seeking both pristine and reliable sound. The Duecanali 804 offers 2 x 400W and represents a lower total power solution for installations in retail, as well as bars and restaurants where a single two-channel amplifier is required, without the need for additional channels or power. The newly completed Duecanali range is able to drive low impedance loads (2/4/8 Ohm) and 70V/100V distributed lines selectable per channel. Furthermore, it provides more than 16 different possible output configurations (Lo-Z, Hi-Z, bridge mode, parallel mode, and combinations of these), delivering a maximum output power per channel of 400 to 1250 W at 8 ? ; 400 to 2400 W at 4 ? ; 500 to 3000 W at 2 ? ; 1000 to 6000 Watt at 4 ? bridged; 800 to 4800 Watt at 8 ? bridged; 400 to 2400 Watt at 100 Volt and 70 Volt. The products are available in standard or DSP+D versions which extend system performance with onboard high-end signal processing and Dante™ digital audio distribution. Come and check out Duecanali, and the rest of our solutions, at booth C628.